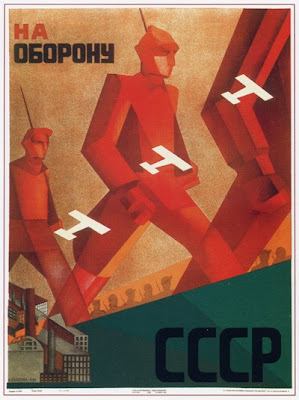 A Soviet Poster a Day Blog is no more! It has ceased to be. But there's no reason to cry as I have just started two other blogs: PrintADog.com and ArtPostersOfWar.com. Feel free to subscribe to "Dog Posters" and "War Posters". I had great time writing stuff about vintage Soviet Art here (120 posters reviewed so far – check the archieves!) and during the last two years of absence I could not stop thinking about the joy of investigating the background of these beautiful artworks. Now I'm not limited to Soviet Union - France, Britain, Spain has produced an equal amount of amazing posters over the 20th century. Also two years ago I got myself a beautiful beagle dog. "My little old dog: A heart-beat at my feet" – this a quote by Edith Wharton – and the dog Harley became my true pride and joy. So my intention to explore the world of dogs is obvious. Thus I started "PrintADog.com". These blogs are updated two-three times a week. I have yet to update lots of things on there– design, site info, etc., so you're comments are most welcome. See you at PrintADog.com and ArtPostersOfWar.com! He invented the “Lies Machine Gun”. And it can be heard on Volga too. In Africa the truth is rumbling. The “Lies Machine Gun” fires in vain. This is a perfect example of the WW2 propaganda poster created by Kukryniksy. The poster shows Hitler, who fires a “Lies Machine”, resembling a machine gun. The device is actually a cartoon of Joseph Goebbels – the Nazi minister of Propaganda. The poster’s verses oppose the newspapers fired by this Lies Machine Gun against the cannonade of artillery at the last battles won by the Soviets. Battles of Rzhev (January 8, 1942—March 22, 1943) were a series of offensives aimed at eliminating the threat to Moscow. They were also named "Rzhev meat grinder" for the huge losses. The Stalingrad Battle (August 19, 1942 - February 2, 1943) was the turning point of World War II in the European Theater. Stalingrad was situated on the river Volga, and the river Don was one of fighting points during its siege. Africa is mentioned as despite the commander’s talent of Erwin Rommel Germans suffered significant losses at Gazala and Tobruk there. Still although in 1942 the situation at battlefronts improved, the war was yet to win, both in Africa and Europe. Buy the WW2 posters at allposters! 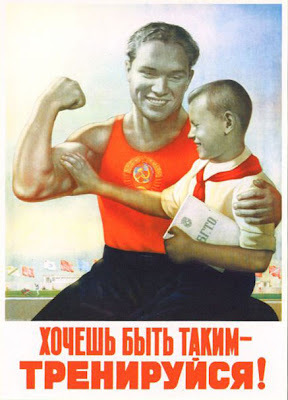 USSR is a mighty sports power! Serious sport has nothing to do with fair play. It is bound up with hatred, jealousy, boastfulness, disregard for all rules and sadistic pleasure in witnessing violence: in other words it is war minus the shooting. After the WW2 the attitude to sport in USSR changed greatly. Before the War training was about building a better citizen and soldier. Now it became professional. The Cold War was at full swing and Stalin considered sport achievements as a perfect way to show the advantages and power of the communist state. The pressure was hard – to take part in the international competitions abroad the Sports Committee Head Romanov had to submit an application with the names of the athletes and personally guarantee their perfect results. In 1952 the USSR first took part in the Olympic Games, held in Finland, Helsinki. The debut was lost – Soviet Union took home 71 medals (22 Gold) less then the USA’s 76 medals (40 Gold). Next year Stalin died, but the hatched of sports war was dug up already. Next Games (Melbourne, Australia, 1956) were won by USSR - 98 (USSR) to 74 (USA) overall medal score; 37 to 32 Gold medal score. The 1960 Games in Rome, Italy strengthened Soviet victorious reputation as the overall medal count was 103 to 71 and 43 to 34 in Gold count. The superiority was significant, - for instance, soviet gymnasts won 15 of 16 possible medals in women's gymnastics. 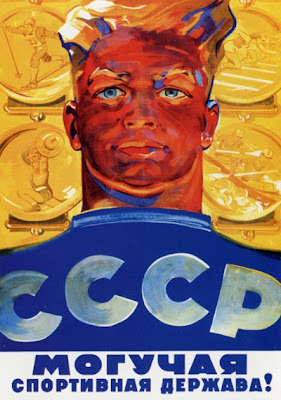 The Games in 1964 were lost; the competition between the USSR and the USA continued, but the early sixties were always considered to be the golden era of Soviet sport. Buy these sports posters at allposters! This is a quote from the speech delivered by Joseph Stalin for the military academies graduates in the Grand Kremlin Palace on the 4th of May 1935. During this event he also uttered another famous phrase: “This is the people, who are the most valuable asset”. Like may other well known quotes this one has several meanings. First of all the thirties were a time of the Great Purge, when Stalin was getting rid of all his political rivals and of those, who might be untrustworthy. Due to these ruthless measures a great many of Soviet people were arrested, convicted and eliminated. Yes, the staff did matter: people should have been absolutely loyal to Stalin. Another thing was obvious enough: the country was right in the middle of the Second Five Year Plan and the rapid industrial development required as many specialists as possible. The country was craving for skilled labor force. Finally, this poster was a part of the Stalin’s Personality Cult which started in 1929, after the Stalin’s fiftieth birthday. Actually it was Stalin who was the most valuable asset of the Soviet Union and the one, who was absolutely impeccable. This is one of the most famous posters of the WW2. It was created by Nina Vatolina, a Soviet poster artist. After the break of War Vatolina along with other artists started making artworks, which covered the most acute topics both of battle front and home front. This one was aimed at increasing vigilance. It shows a working woman in kerchief, who holds her finger to lips, which is a gesture for silence. The face pictured had a real prototype, who turned out to be Vatolina’s neighbor. Her sons were at battle-front, so her stare did have a certain attitude. The verse was written by Samuil Marshak – a Soviet poet, who is most known as the author of numerous fairy tales and poems for children. 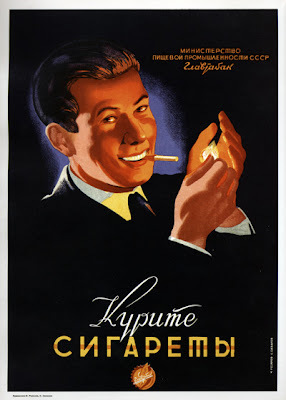 During the War he was busy writing satire and pamphlets as well as collaborating with various poster artists, including Kukriniksy (see their posters). Also, during his life Marshak did brilliant translations of Robert Burns, William Shakespeare, William Wordsworth, John Keats, Alan Milne and Rudyard Kipling. 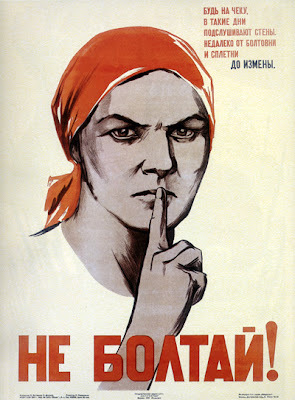 Nowadays this poster has a new life as it turns out to be quite popular in Russia and abroad. In the era of strict corporate policies and constant privacy infringement “Keep your mouth shut” slogan does make sense, you know. Buy this very poster at allposters here!